A.N.D. Applauds Collaboration that Fosters Future Social Service Workers - A.N.D. 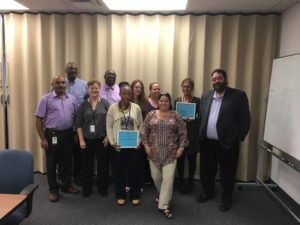 At the monthly quality meeting of the Document Imaging and Scanning (DIS) team of the Division of Social Services, Ability Network of Delaware member agency, DePaul Industries awarded 3 temporary staff certificates of appreciation for their outstanding performance provided to the state. There are multiple service centers in the state that provide countless support services to Delawareans on a daily basis; each of these services are then documented and electronically logged into a database to allow for future access to records throughout the state service center network. Through a partnership with DSS, A.N.D.s State Use Program providers are able to provide this valued service to the state while creating meaningful work for persons with disabilities who are also considered TANF eligible. Josh Latshaw, Regional Manager at DePaul presented Shakeya Hodnett, Dawn Cirillo, Samuel Jani with framed certificates for consistently exceeding their performance quotas. More importantly, as recent history has shown, the employees’ high productivity will likely be further recognized through regular employment at the state as social workers. To date, three of DePaul’s employees have obtained employment at the Division of Social Services after demonstrating their abilities as temporary DIS workers, most of which obtained merit employment as social workers. Special thanks go to Ray Fitzgerald, Director of DSS, for cultivating an employment model that recognizes performance by promoting from within. These employment outcomes represent the true purpose and value of A.N.D.’s State Use Program.